Individuals thinking about starting an exciting career in the rapidly advancing field of ultrasound and sonography should consider taking the leap now. These methods stand out as useful techniques in the healthcare field, replacing older, more invasive diagnostic tests. Due to medical advancements and the need for more healthcare professionals to keep up with the aging baby boomer population, the Bureau of Labor Statistics projects that the number of sonographer positions will experience 17% growth between 2016 and 2026. Earning an ultrasound technician certification online can pave the way for a successful career with above average earnings. 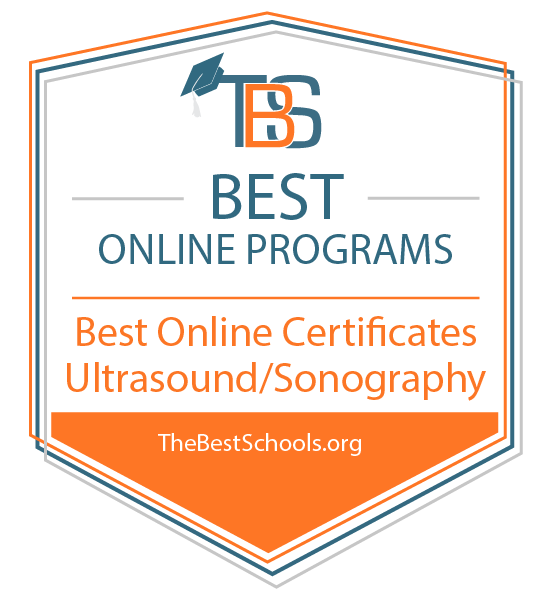 What Else Can I Expect From an Online Certificate in Ultrasound and Sonography Program? What Can I Do With an Ultrasound and Sonography Certificate? 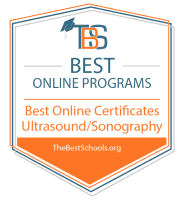 Online Certificate in Ultrasound and Sonography Degree Program Ranking Guidelines: We selected the degree programs based on the quality of program and range of courses provided, as well as school awards, rankings, and reputation. The value of any ranking list of schools and/or degree programs depends on having a methodologically sound assessment of each school’s/program’s characteristics, especially insofar as these can be objectively measured. A college or university is a complex entity, with numerous factors to consider, and distilling these down to the place where meaningful comparisons can be made to form a defensible ranking list becomes part science and part art. Considers years of faculty experience both inside and outside of academia. Because students tend to review a variety of information when choosing a school, the weight a student gives any one criterion will vary. For instance, it’s not enough to offer a carefully constructed ranking of great schools if many are too expensive or too difficult to get into. Get the best rankings here AND get them to suit your personal needs. That’s TheBestSchools.org advantage! If you have any questions about our ranking methodology, please contact us. Citations: For a broader account of our ranking methodology, especially as it relates to TheBestSchools.org’s underlying educational philosophy and, in other ranking articles, looks beyond academic excellence (as here) to such factors as return on investment or incidental benefit, see our article “ Ranking Methodology: How We Rank Schools at TBS.” Reputation of schools and degree programs can at least in part be gauged through the rankings of other well-known educational ranking companies. At TheBestSchools.org, we keep track of such social and peer validation: “ Making Sense of College Rankings.” For nuts-and-bolts information about colleges and universities, we look to the National Center for Education Statistics and especially its College Navigator. Insofar as salary and inflation data are relevant to a ranking, we look to the Bureau of Labor Statistics. Finally, nothing beats contacting schools and degree programs directly, which our researchers often do, with the result that all the entries in this article should be considered as belonging to this citation! A Catholic university founded in 1924, Misericordia University is in Dallas, Pennsylvania, and has an enrollment of nearly 3,000 students. Its College of Health Science and Education offers a certificate in diagnostic medical sonography (DMS). The 18-month program provides ultrasound technician certification online for working adults who require scheduling flexibility. Classes cover content like ultrasound physics and instrumentation, abdominal sonography, obstetrical sonography, and pathology and clinical integration. The 48-hour program also requires clinical placement for hands-on learning, so students must submit background checks and immunization documentation prior to enrollment. Upon program completion, graduates demonstrate proficiency in interacting with faculty, colleagues, and patients. In addition, they comprehend and recall complex information learned in their coursework and know how to appropriately respond to the challenges that both emergencies and clinical environments demand. The program prepares students to sit for national certification exams through the American Registry of Diagnostic Medical Sonography (ARDMS). Misericordia is regionally accredited by the Middle States Commission on Higher Education. The online DMS program is fully accredited by the Commission on Accreditation of Allied Health Education Programs. Located in Big Rapids, Michigan, Ferris State University prepares specialists in diagnostic medical sonography through its certificate in vascular ultrasound. Graduates of this online ultrasound certification program develop skills using the instrumentation required to gather and document information concerning physiology and blood vessel anatomy. Graduates can aid physicians in diagnosing and treating vascular disorders related to the blood supply to and from the body's vital organs. This knowledge helps when determining neurological disorders, cardiovascular pathologies, and diabetes complications. The program targets current sonographers who wish to continue their education. Enrollees must be certified through either the American Registry of Diagnostic Medical Sonography (ARDMS) or American Registry of Radiologic Technologists (ARRT). Students must earn at least a "C" in each class and pass a mock vascular registry exam with at least 77%. In addition, they must earn at least 85% on their final portfolio. Upon certificate completion, students can sit for the ADRMS registered vascular technology certification exam. Ferris is regionally accredited by the Higher Learning Commission. The DMS program is fully accredited by the Commission on Accreditation of Allied Health Education Programs. The list below provides a sampling of ultrasound certification courses commonly offered as part of ultrasound and sonography programs. For specific curricula, students should visit the websites of individual schools. Many ultrasound technician certification online programs begin with an introductory course that covers the concepts students need to pursue more advanced studies. Some of these foundational topics include the history of ultrasound and sonography, medical terminology specific to ultrasound and sonography, and clinical assessment. This course covers the physics of sound, sound waves, and ultrasound waves as they pertain to medical sonography. Specific areas of study include transducer construction and function; the physics of the Doppler effect; the principles of Doppler techniques, such as pulsed Doppler and color flow Doppler; and adjusting system controls to adjust physical parameters. Students learn how to study the normal anatomy of a developing fetus, from fertilization through the third trimester. Specific procedures include calculating gestational age; assessing fetal structures; and diagnosing potential complications, such as ectopic pregnancy, placental abnormalities, and congenital anomalies. This class focuses on the anatomy, physiology, pathology, and pathophysiology of the neck, thyroid, breast, scrotum, and musculoskeletal system. Students also learn scanning skills, different procedures used to assess normal and abnormal sonographic images, and ways to identify specific conditions from those images. How Long Does It Take to Get an Online Certificate In Ultrasound and Sonography? The length of time required to earn an online certificate in ultrasound and sonography or ultrasound tech certification depends on several factors. Ultrasound certification courses require both an educational component and a clinical practice component. The level of experience and education a student brings to a program impacts the length of their course of study. For example, if a student already has experience in a related allied health position and is looking for a career shift, they rarely need to complete all of the clinical requirements. Similarly, if a student possesses an associate or bachelor's degree in a health field, they seldom need to complete all of the educational requirements. Program credentialing also represents an important factor that can affect program length. For example, some programs prepare students for ARDMS, ARRT, or CCI certification. In most cases, students can expect to earn a certificate in 1-2 years. When picking a sonography program, students generally choose to earn either a diagnostic medical sonography certificate or a diagnostic medical sonography degree. A certificate program can take as little as one year to complete, while a degree can take up to four years. Due to the added time commitment, earning a degree costs more. However, the additional time and money spent earning a degree often result in a higher starting salary. Graduates of ultrasound and sonography certificate programs can pursue many career options. Several speciality sonography positions share similar foundational knowledge and skills but differ in their area of expertise. Examples include obstetric sonography, musculoskeletal sonography, and echocardiography. Some professionals work with patients while others work independently or with physicians. Additionally, some specialties primarily help elderly patients, while others work with children and/or pregnant women. Diagnostic Medical Sonographer: These professionals operate special imaging equipment to create images or conduct tests. These images and test results help physicians assess and diagnose medical conditions. Radiologic Technologist: These individuals perform diagnostic imaging examinations on patients. Using X-rays remains the most common technique, but professionals may also perform MRIs or CT scans. Medical Technologist: These highly trained professionals perform and analyze the results of complex scientific tests carried out on blood and other bodily fluids. They work in hospitals and independent laboratories using sophisticated procedures and equipment. Nuclear Medicine Technologist: These workers prepare small amounts of radioactive substances, called radiopharmaceuticals, and other medications. They administer these substances to patients for diagnosis through imaging or for therapeutic purposes. Cardiovascular Technologist: Similar to diagnostic medical sonographers, these professionals focus on imaging the cardiovascular system, helping doctors assess the system and diagnose problems. Graduates of ultrasound and sonography certificate programs often transfer to an associate or bachelor's program to further their education. The list below describes five degree that individuals may want to consider earning. Some programs share specific articulation agreements, allowing students to seamlessly transfer certificate coursework to a degree-granting institution. Certificate holders may choose to transfer and pursue a degree to increase their earning potential, specialize in more than one area, and/or set themselves up with a stronger foundation for future positions in research or education. Associate of Applied Science in Diagnostic Medical Sonography: This degree teaches students the technical and professional skills needed to work with highly technical equipment using high-frequency sound waves to view the human body. Earning this degree allows graduates to assist physicians with diagnosis and treatment. Associate of Arts in Diagnostic Ultrasound Technology: While most programs award associate of science or associate of applied science degrees in sonography and ultrasound, schools that offer associate of art degrees may place more emphasis on research, writing, and communication. Bachelor of Science in Vascular Ultrasound: These programs prepare sonography and ultrasound students to diagnose and treat patients with blood vessel disorders. Participants learn about scanning techniques, image and data analysis, and how to properly report results based on snapshots of blood vessels and blood flow. Bachelor of Science in Diagnostic Medical Sonography: This degree teaches students how to properly operate ultrasound equipment and prepare patients for diagnostic procedures. Many programs feature science classes, practical experiences, and a liberal arts education. Bachelor of Science in Radiation Science: While similar to a bachelor of science in diagnostic medical sonography, this degree track focuses more on other imaging equipment and techniques, such as X-ray, CT, and MRI scans. Some schools may also incorporate radiation therapy. Depending on their quality, certification programs may or may not hold accreditation. Individuals should always endeavor to attend accredited schools. The Commission on Accreditation of Allied Health Education Programs (CAAHEP) stands as the main accrediting body for the sonography and ultrasound field, representing the largest accreditor of health science programs. CAAHEP ensures that ultrasound and sonography certificate programs meet national education standards. CAAHEP-accredited programs also meet certification requirements established by the American Registry for Diagnostic Medical Sonography, the American Registry of Radiologic Technologists, and Cardiovascular Credentialing International. Individuals who do not attend an accredited program may encounter difficulties transferring to a college or university or finding employment. Students who need help paying for their certificate in ultrasound and sonography can access many financial aid options. Learners often pay for their education through a combination of student loans, grants, and scholarships. The Society of Diagnostic Medical Sonography offers grants that can help students pay for classes, certification examination, and research projects. Individuals who decide to pursue a certificate while working may also qualify for tuition reimbursement from their employers. Students should also make sure to complete a Free Application for Federal Student Aid (FAFSA) form to see if they qualify for funding from the federal government.